Grilling is a great way to add flavor to fish meat. If you like a more delicate flavor, pack the fish in foil, add wine, lemon juice, some vegetables and herbs. The fish will be as flavorful, but without the grill marks. 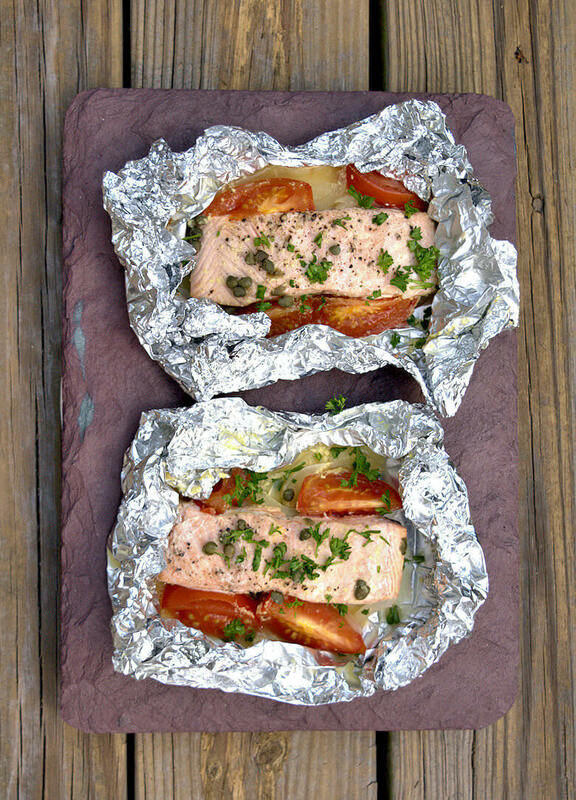 Grilled Salmon with Wine in Foil is very moist. Good news is, you don’t have to clean the grill afterwards. Weather was a determining factor in the preparation of this salmon. It is very unpredictable here right now, one moment it rains, the next it is steaming hot, emphasis on steaming. And if there is one thing I don’t like, it is grilling in the rain. This salmon recipe can easily move from the grill into the oven and have the same result. I love salmon, but I always buy the least fishy one. Sometimes the flavor of a salmon can be overwhelming, and if I have the option, I buy the least fishy version. I think the colder the water, the stronger the flavor. This recipe calls for 2 salmon fillets, skin on. Cut 4 pieces of aluminum foil, large enough that you can close it around the fish and vegetables and seal. Double the sheets of foil per fish fillet, so you have less of a chance that it tears or is that you burn the fish. Alternatively, you can use heavy duty foil if you have that handy. Place salmon fillets, approx. 8 oz. each, skin down on the aluminum foil. You can also make this recipe with other fish types. Sprinkle with salt and pepper. Add the tomato, onion, and the liquid, consisting of white wine, lemon juice, mustard and capers. Then close the foil around the fish and place the packets on the grill. Grill for approx. 10 minutes on a medium-high temperature. 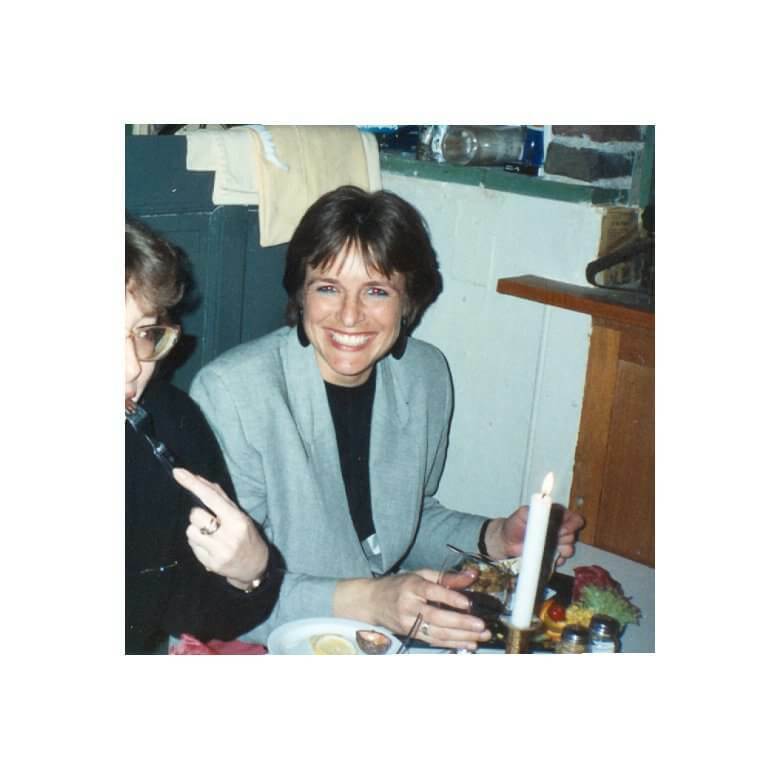 The title of the recipe is Grilled Salmon with Wine in Foil, because it is prepared on the grill. The fish is actually not grilled, the packets are; the fish is steamed and poached at the same time. Poached because the fish is in a liquid (not submerged though) that is not boiling. Steamed because the steam produced cannot escape the packet. You have it tightly closed. Thus we have 3 cooking method taking place at the same time. Check the fish every now and then, and make sure you close the packets again. The fish is done when it falls apart easily. Serve the fish in the packets, something different. If you are more interested in actually grilling of salmon, have a look at this recipe Salmon with Orange Maple Mustard Glaze. The Salmon is grilled on a cedar plank and flavors are much stronger than the salmon packed in the foil. Grilling fish is a great way to add flavor to fish meat. If you like a more delicate flavor, pack the fish in foil, add wine, lemon juice, some vegetables and herbs. The fish will be as flavorful, but has no grill marks. It is very moist. Good news is, you don't have to clean the grill afterwards. Place 2 pieces of aluminum foil on a flat surface, large enough to fold over the fish and seal. Use 2 layers for normal aluminum foil or 1 layer for heavy duty foil. Place each salmon fillet, skin down on the foil. Sprinkle fish with salt and pepper. Cut tomatoes in 8 pieces. slice onion thinly and divide over foil. Mix white wine, lemon juice, mustard, and capers and pour on fish. 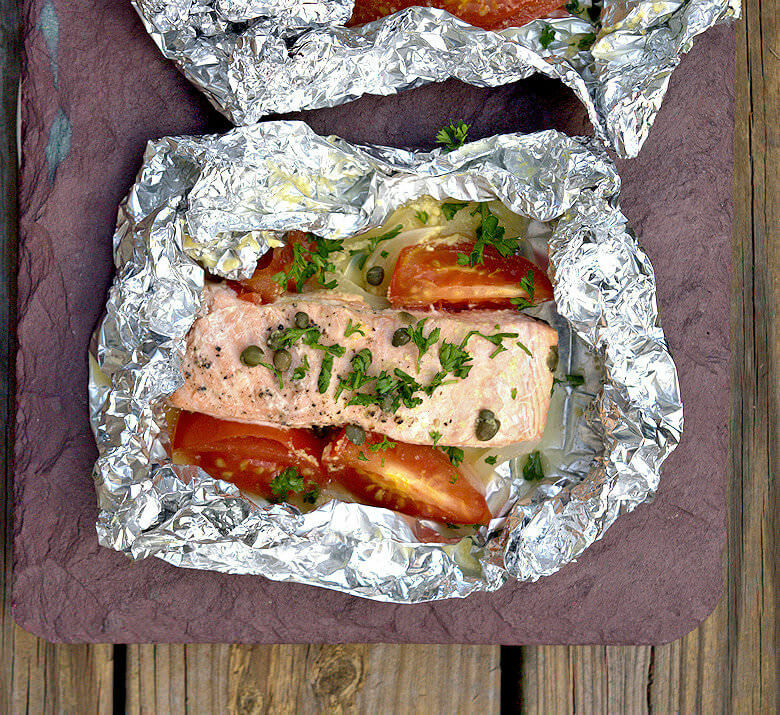 Fold aluminum foil around the fish and seal closed. Place each foil packet directly on the grill of medium-high heat. Cook/grill for approx. 10 minutes. Open packets and garnish with parsley. Serve in foil and enjoy.